The application of alternating current is advantageous in energy transfer over long distances. It is a well-known fact now, but subject of long conflict in the era of pioneering works in electric power production. There are also some processes in physical chemistry, organic and inorganic chemistry, in biochemistry and related sciences, which take place in opposite directions, with consecutive alternations in time. However, the very existence of alternate reactions, now known as the oscillatory or oscillating reactions, has long been disputed because it was thought that it is contrary to the basic principles of thermodynamics. Nevertheless, according to our knowledge, there are no oscillatory reactions without catalytic loop as the essential part of a mechanism. There could be a fundamental rule that catalysis is necessary to generate oscillations in concentrations and reaction rates. Particularly, homogeneous oscillatory reactions are often subject of research as relatively simple systems with good chance to clearly define feedbacks responsible for instability phenomena. However, oscillations can at least equally often be found in heterogeneous catalytic reactions. 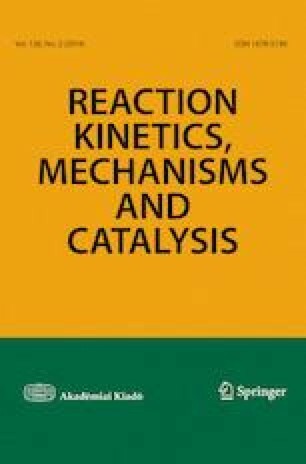 Recently, changes in product selectivity was proved when Pd catalyzed carbonylation of phenylacetylene was moved to the oscillatory dynamic state. With this simple result, the doors are now open for wide spectrum of research projects and applications. The present investigations were supported by The Ministry of Education, Science and Technological Development of the Republic of Serbia, under Project OI172015 and III45001.